TSSPDCL JAO Junior Accounts Officers Recruitment Results, Certificates verification dates 2018: TSSPDCL / TS Southern Power Distribution Junior Accounts Officers(JAO) Recruitment/TSSPDCL / TS Southern Power Distribution JAO Recruitment Online application form/TSSPDCL / TS Southern Power Distribution Recruitment 2018/TSSPDCL / TS Southern Power Distribution JAOs recruitment 2018, Results/Merit List/TSSPDCL / TS Southern Power Distribution JAO Recruitment Hall tickets, Results 2018/ TSSPDCL / TS Southern Power Distribution JAO Recruitment Results 2018 TSSPDCL / TS Southern Power Distribution Junior Accounts Officers(JAO) Recruitment Selection list Results 2018: TSSPDCL / TS Southern Power Distribution has releaseed the Junior Accounts Officers(JAO) Recruitment 2018 Notification and AP State Power Generation Corporation Limited (TSSPDCL / TS Southern Power Distribution) invites the #onlineapplications from the eligible and qualified candidates for the post of Junior Accounts Officers(JAO). 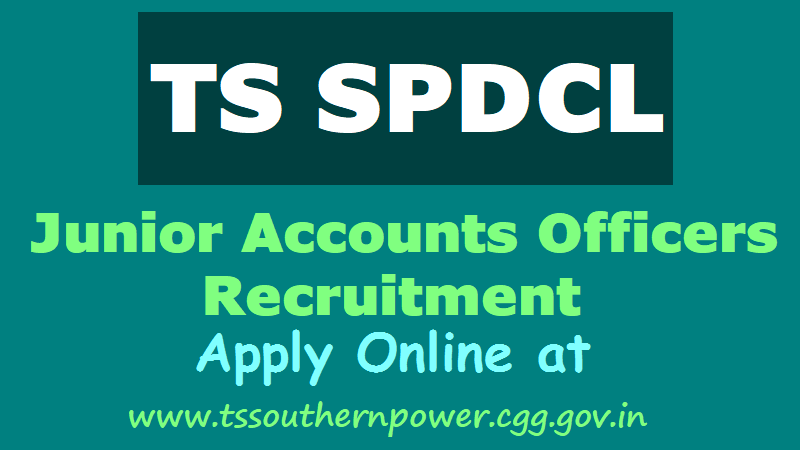 TSSPDCL Recruitment for 114 Junior Account Officer Vacancy : - Southern Power Distribution Company of Telangana Ltd (TSSPDCL) has issued a latest notification for the recruitment of 114 posts. The post name is Junior Account Officer. If you want to make career at TSSPDCL Vacancy then you can apply online application from 02 February 2018 to 19 February 2018. It is golden opportunity for interested candidates, who are seeking government job in TSSPDCL Vacancy. Further other details are given below. Post Name: Junior Account Officer. Salary: Rs. 41155-44555 per month. Last date: 19 February 2018. Age limit: 18 to 44 years. Selection Process: Their performance in written test. How to apply: Online at www.tssouthernpower.com. On the basis of Written Examination held on 25-03-2018 to the posts of Junior Accounts Officer in TSSPDCL, the candidates with the following Hall Ticket Numbers have been provisionally called for verification of Certificates, subject to Court Orders, if any. at the time of verification of documents. No request will be entertained for subsequent submission of any of the above certificates. The Original Certificates will be retained with TSSPDCL. The verification of the certificates will be held TSSPDCL Corporate Office, 6-1-50, A-Block, Mint Compound, Hyderabad from 16-05-2018 to 17-05-2018 from 10:30 AM to 05:00 PM as per the schedule mentioned. If, on further Verification it is found that any candidate is not eligible with reference to the particulars furnished by him/her in the Application Form / Check List / Certificates, the results of such candidate / candidates shall be cancelled at any stage of selection process. claim for appointment for the post of Junior Accounts Officer against the said notification. The verification of the original certificates doesn’t confer any right for selection /appointment. i) The Recruitment will be processed as per this Notification and also as per the rules and instructions issued by the Government/ Corporation from time to time. ii) Caste & Community: Community certificate issued by the competent authority should be submitted at appropriate time. Backward Classes, Schedule Castes and Schedule Tribes belonging to other states are not entitled for reservation. iii) Posts notified for Head Quarters shall be filled up first from the General Merit list duly following the ROR. After completion of the said selection, candidates will be selected for Zonal posts. iv) Zonal/Local: The selection List will be drawn in two parts. The first part will comprise 30% of the posts consisting of combined merit list of local as well as non - local and the remaining second part will comprise the balance 70 % of the posts consisting of locals only and the posts will be filled only following the rule of Reservation. v) The whole Recruitment and selection process is carried out with utmost, secrecy and confidentiality so as to ensure that the principle of merit is scrupulously followed. A candidate shall be disqualified for appointment, if he himself/herself or through relations or friends or any others has canvassed are endeavoured to enlist for his/her candidature, extraneous support, whether from official or non- official sources for appointment to this service. Junior Accounts Officer: The candidate should possess the following qualifications as on 01.10.2018. B.Com First Class or its equivalent of any recognised university of India. (Or) First Class Post Graduate Degree of M.Com of any university in India established or incorporated by or under a Central Act, Provincial Act, or State Act or any equivalent qualification. (Or) Pass in IPCC (formally known as Intermediate) the Institute of Chartered Accountants of India. (Or) Pass in Intermediate Examination of the Institute of Cost Accountants of India. Rs.100 by online through TS Online Centers/ Portal or Internet Banking/Debit Card/Credit card. Rs.120 examination fee by online through TS Online Centers/ Portal. The applicants belonging to SC, ST, BC and PH categories are exempted from payment of examination fee. A) Written test will be conducted in the following manner. Section -A On core academic curriculum. Section - B Computer Awareness. Each candidate should secure minimum 30% Marks in each section otherwise shall be treated as disqualified. B) The minimum qualifying marks in the written test for the above selection process shall be for OCs - 40%, BCs 35%, SCs, STs and Physically challenged - 30%. N.B. Mere securing minimum qualifying marks does not vest any right to a candidate for selection to the post of Junior Accounts Officer. C) Only those candidates who qualify in the written examination by being ranked high, community wise will be selected as per rules in vogue. D) The candidates will be selected and allotted to Head Quarter posts as per their rank in the general Merit List. E) The candidates will be selected and allotted to Zones/Generating stations as per their Rank in the merit list and as per zonal preferences for allotment of non-local candidates against vacancies available. Selection shall be made on State Wide merit, in respect of non-local candidates and allotment to Zones shall be made as per the preference given by candidate in his/her online application, against the actual vacancies. The said preferences are only indicative for being considered to the extent possible but no binding. Therefore, the TSSPDCL / TS Southern Power Distribution has the power to assign a successful candidate to any notified post in the zone in respect of non-local candidates, for which, he/ she is considered to be qualified and eligible, subject to fulfilling the selection criteria. Mere claim of preference for any zone for allotment against vacancy does not confer any right to selection for that Zone in particular or any Zone in general. F) Candidates have to produce original documents viz. Date of Birth Certificate, Educational Qualification certificate/s, community certificate, physical disability certificate (disability not less than 40% pertaining to VH and OH and 75% in respect of HH) issued by the concerned competent Medical Board, if any, study/ residence certificate and other particulars for verification as and when required and called for. If the particulars furnished in the Online Application Form do not tally with the original documents produced by the Candidates, his/her candidature will be rejected. G) The persons already in Government Service/autonomous bodies/other Corporations etc., whether in permanent or temporary capacity or as work charged employees must take print out of the application after properly filled and get it endorsed by his/her employer and keep it with him/her ready, so as to , submit the same as and when called for. H) The appointment of selected candidates will be subject to their being found medically fit in the appropriate medical classification. The candidate has to apply online through APPLY ON LINE link at www.tssouthernpower.cgg.gov.in or directly through TSSPDCL website www.tssouthernpower.cgg.gov.in link after carefully going through the instructions mentioned therein. Application Fee and Exam Fee: Rs.100 by online through TS Online Centers/ Portal or Internet Banking/Debit Card/Credit card. Rs.120 examination fee by online through TS Online Centers/ Portal. The applicants belonging to SC, ST, BC and PH categories are exempted from payment of examination fee. Note:- If you have any query regarding selection process then you must see the notification and read carefully. Starting date for online application - 02 February 2018. Last date for online application - 19 February 2018.